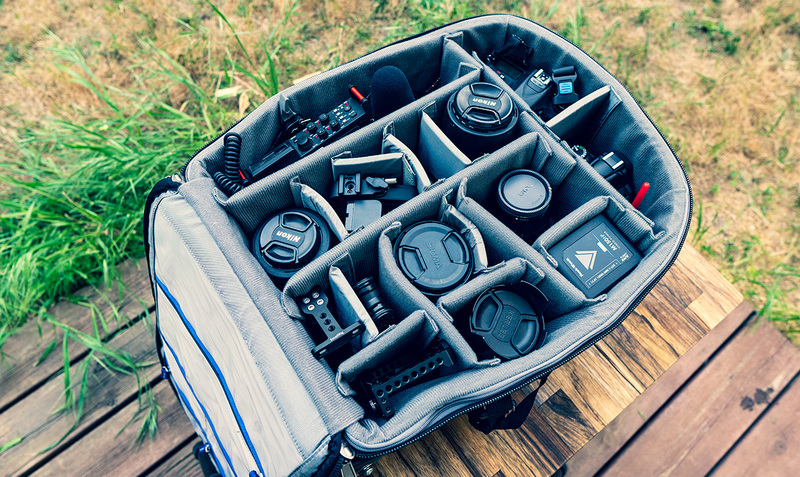 Over the years we have tested numerous camera bags here on LensVid but today we are going to take our first look at a professional rolling camera bag made by the California based company Think Tank. Let’s start by taking a look at some of the physical characteristics of the Airport International Version 3. The bag itself is extremely well made. There is something in the materials and the stitching that immediately caught our eye and when holding the bag in the hand you can feel how robust it really is – this thing is made to last. The bag is a little bit smaller than the Manfrotto Roller Bag 70 that we have been using for the past two years or so (the Roller Bag 70 is a great case, which we didn’t review mostly because Manfrotto had announced a newer version back in Photokina 2016). The Think Tank will give you a little bit less room inside but is easier if you are taking it as a carry on onto a plane (especially on smaller planes which do not have a lot of room in their overhead compartments and on local flights). The bag weighs close to 5kg (or 11 pounds), a bit less if you remove some of the padding and the rain cover and measures 53.3cm (21″) long over 35.6cm (14″) wide and 20.3 cm (8″) thick. It can hold up to a 500mm f/4 lens (without a body) or 400mm f/2.8 lens with one. Depending on the specific setup you can fit in 2 FF bodies and about 7 medium sized lenses plus some accessories. Keep in mind that such a setup will likely bring you to well over 10kg (22 pounds) which can be over the max weight limit for a carry on for some airlines. Front open pocket – is made of a stretchy material and you can use it to put a tablet, laptop or a book for temporary storage if you don’t want to open the laptop compartment. Laptop compartment – is in the front, it is relatively lightly padded, but has room for a large 15″ laptop (our 13″ laptop had tons of room to spare), a tablet and some other thin accessories in a very organized way (including a nice see-through pocket with a zipper which can come in handy). 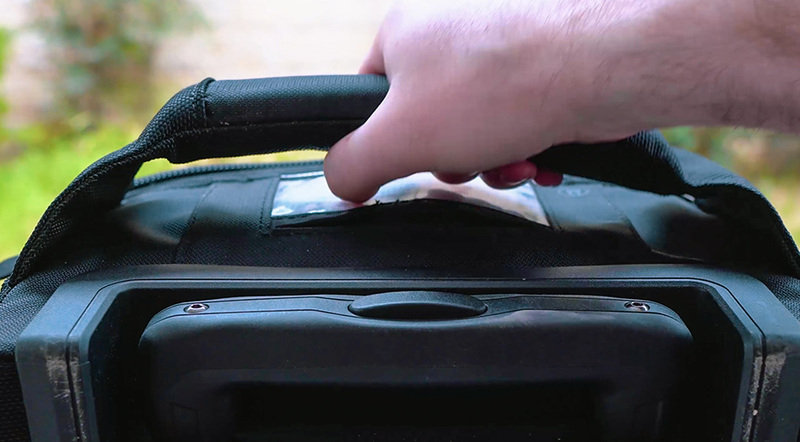 Top lock compartment – On the top of the bag you have a small pocket with an included security lock and cable – useful if you want to tie your roller while taking a nap in an airport for example – certainly a nice touch. Side pocket – this can be used for a bottle of water or some documents but also for a small tripod. 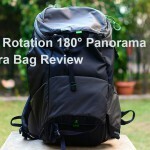 For a full-size tripod, this bag comes with a dedicated solution – more on that later on. Main gear compartment – the main gear compartment is where all the action takes place. It is extremely well padded and comes with a large number of dividers, some of which you might want to remove, depending on your gear. 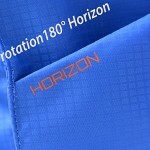 On the cover, you can find 4 other see-through pockets with zippers which we love. One thing which seems to be missing is a holder for the cover which exist on the Manfrotto Roller Bag 70 and we actually find useful. 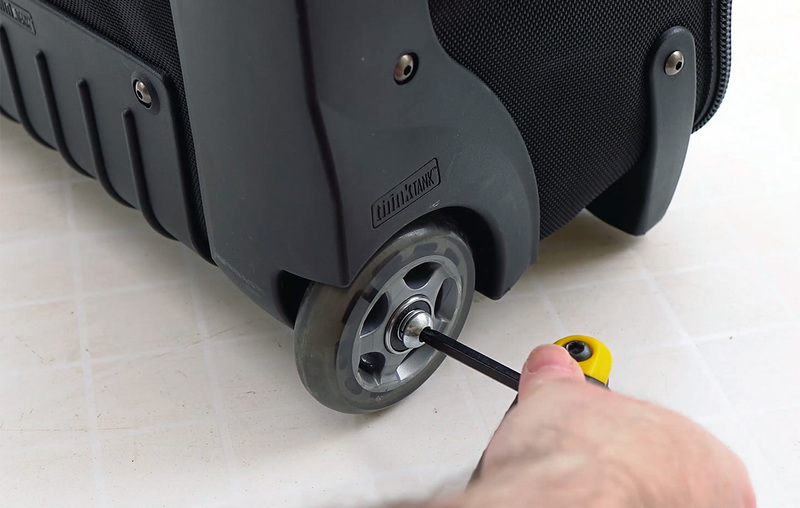 Wheels – the bag has 2 user replaceable 3″ wheels (in case they wear off and you want to replace them). 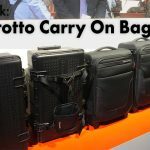 Carrying handles – The top and side carrying handles are super padded (much more than those on the Manfrotto bag) and you even have a thin handle on the other side which you don’t get at all on the Manfrotto. Rain cover – the bag comes with a separate rain cover (it left us scratching our heads a bit but honestly we never had a real need for those so this is probably why we are so clumsy with these things). Tripod carrying – as we mentioned before you can put a small tripod on the side pocket, but if you want to carry a full-size tripod the bag comes with a dedicated carrying system. 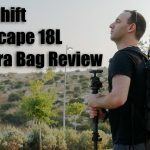 It is a great idea but the one on the Vanguard Alta Rise 45 that we reviewed here last year was better designed as it was part of the bag – still it is usable and a better solution than the front facing tripod carrying solution of the Manfrotto Roller Bag 70 in our opinion. Handle – the bag has a 4 section aluminum telescopic handle which goes higher than the one on the Manfrotto (despite being a shorter bag) it also feels a bit better made. Locks – besides the lock with the cable on the top pocket, this bag also come with a TSA lock on the side. We never used it but it is nice to see so many security options (the Manfrotto has none of these by the way). We have been using this bag on some of our commercial productions over the past several months mostly alongside the Roller Bag 70 due to the amount of gear that we normally take with us. 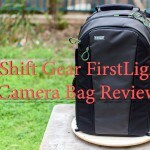 The bag functioned perfectly and we had no real issues. We really would like to see ThinkTank adding a holder for the cover and maybe making the tripod carrying solution a bit simpler to assemble. 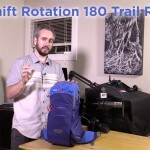 On the plus side – the carrying handle is fantastic and much more convenient to lift or carry up the stairs with all the padding than the one on the Manfrotto bag. So lets some things up. If you are looking for a high end, durable trolley camera bag to carry your expensive photo or video gear you really can’t go wrong with the Airport International V3.0. 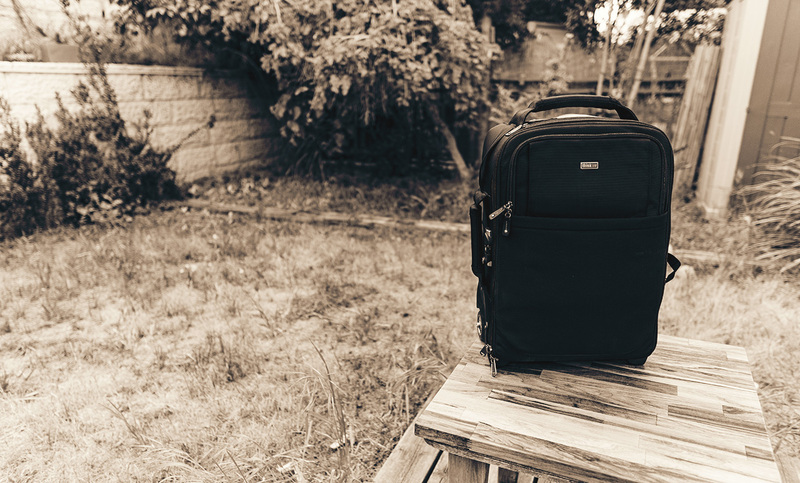 This bag is compact but still roomy enough for most setups, it is extremely well padded and very well made with lots of small but important touches like dual security locks, strong tripod carrying system and quite a few see-through zipped pockets for all your smaller accessories. There is very little not to like about this bag apart from the lack of a cover holder and the somewhat heavy weight which is the direct result of all the extra padding. 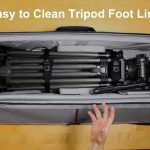 As for pricing, Jordy from Cinecom did a comprehensive comparison of 5 pro level camera trolley bags which we published here a few months ago (really worth checking out if you are about to get one). 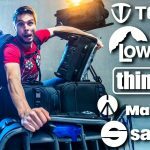 Like us Jordy found the ThinkTank to be an all-around great bag (apart from the lack of a cover holder which we also mentioned) but the bag is also the most expensive, selling for just under $400 (although both the new Manfrotto and Tenba bags were not too far behind at $380).